Upon breaking the crust, we first get a nutty note reminiscent of fresh nuts followed by delicate aroma of molasses. The sweet nutty flavour comes through in the cup and is free of all harshness. The cup is well rounded with a mellow body and is complimented with a mild acidity finish on the back of the tongue. The result is a well balanced cup of decaf that has great character alone or to be used as a strong foundation for a more complex blend. (Our Premium Sumatra decaf has the typical Sumatra characteristics that we have come to expect from this origin. When we first break the crust we are struck with the unmistakable nutty notes with a slight earthy undertone. With a quick slurp this full bodied decaf dances with flavours of herbal, chocolate, earthy, spicy and woody notes. The parade of flavours is accented with its medium to low acidity. This decaf is a smooth full bodied decaf with a medium low acidity. Great as a single origin or blend component. Like the Premium Sumatra, this Commercial version has the same sweet, nutty characteristic upon breaking the crust followed by the unmistakable nutty notes with a slight earthy undertone. As with its cousin, the aroma persistence continues in the cup. The medium light body cup is complimented with a clean finish and moderate acidity. This coffee is a great for roast and ground products that need a greater mouth feel. This decaf features a fragrant aroma with hints of floral and fruity undertones to complement its nutty notes. The subtle fruity taste of this coffee is accompanied by a moderate acidity and light body. The nutty sweetness mixed with the fruity notes creates a balanced decaf with a clean finish. The aroma of this morning blend staple combines nuts, spices and molasses in a well balanced aroma that will open your eyes and bring a smile to your face. In the cup, this coffee persists with rich flavours of nuts and sweet molasses. A fruity character with a brisk dry acidity and light syrupy mouthfeel make this decaf a unique must have in any decaf lineup. The aroma is nutty with slight citrus notes. In the cup, this decaf produces a rich, sweet nutty almond flavor with slight citrus notes. The cup is smooth and moderate in body. The brightness, or acidity, common to Costa Rican coffees is reminiscent of a lively winey acidity. This decaf is perfectly balanced in flavour and aroma and is complemented with a clean finish. The first impressions when breaking the crust is sweet nuts with faint citrus note undertones. The persistence continues in the cup. The aroma transforms to sweet spicy nuts with bright acidity. The cup is clean, bright and medium bodied. The clean finish leaves you wanting more. Like the Premium Central Blend, this Commercial version has the same sweet, nutty characteristic upon breaking the crust followed by a slight citrus undertone. As with its cousin, the aroma persistence continues in the cup. The medium light body cup is complimented with a clean finish and moderate acidity. This coffee is a great for roast and ground products. Our Premium 1/3rd Blend has raised expectations from this industry staple. It was once the orphan of the cupping room but cuppers are now pleasantly surprised. When the crust is broken, the first impression is the clean nutty sweetness that tickles your olfactory receptors. A pleasant surprise from an old nag. One whiff and you know this 1/3rd blend is different. In the cup it’s complex with nutty flavours enveloped with hints of chocolate and sweet spice. The medium bodied cup is absent of pronounced earthy notes typical found in this type of blend and has a crisp finish. This product is very versatile. This product was created to replace the old industry 1/3rd blend but with a cleaner finish. Breaking the crust frees a pronounced one-dimensional nutty note. However, this changes on your first slurp when the nutty note is complimented with a more complex sweet spice and herbal accents. The cup has a medium to light body to complement its medium to light acidity. The finish is clean. This is the mainstream coffee stable. The break reveals a nutty aroma with a hint of chocolate. In the cup the aroma characteristics persist with the addition of typical Robusta earthy notes. The bitterness of this Robusta is low and body is half full. The mild acidity is complemented with a clean taste. 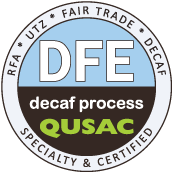 QUSAC also has a host of other certified coffee available upon request. These products have exceptional cup characteristics are truly stand out in the world of fine quality decaf. Speak with us about products that could be of interest and we will prepare samples according to your specifications and for your evaluation.